I appreciate that the BBC is funded by a combination the UK TV license fee payer, UK Government grants and overseas sales of programmes/DVDs/etc, but surely there must be someone at the BBC clever enough to work out a way to make the iPlayer available via a subscription model to non-UK residents. In case you don’t know about the iPlayer, it broadcasts a rolling week of a full set of the programmes broadcast on the BBC in the UK. As an ex-pat, that all sounds very interesting, but sadly it isn’t available to anyone outside the UK. I am sure the reasons why they can’t magically make it available internationally are complex and completely understandable, but it doesn’t stop me wishing they would come up with a clever way around it. I have asked around other ex-pat friends and everyone I speak to is interested in the service and prepared to pay. Surely this could be a significant revenue generator and surely just a matter of time before it happens. Before you say anything, yes I am aware I can get hold of the BBC’s output via a variety of legal and decidedly grey channels, but I’d rather encourage the Beeb to do the decent thing and sort out a way themselves – afterall they did it with the Radio Player. The concept of personalised homepages just doesn’t go away. Just about every media company/portal seems to have tried it once and the BBC is back for a second go with the the new BBC Beta homepage. Despite all the hullabaloo, the first wave of personalised sites failed. The failure was partly that the technology didn’t quite live up to the CMS company hype and partly that people wouldn’t invest the time in personalising the site. So will things be different this time? I think it is a question of how well the site can automagically learn what I like without me having to tell it. If it works in a brave Amazon recommendations type way, I think it could have something in it, but if the system sits their timidly only recommending things that match exact phrases I’ve already searched for, I think it is only a matter of time before it goes the way of My BBC. 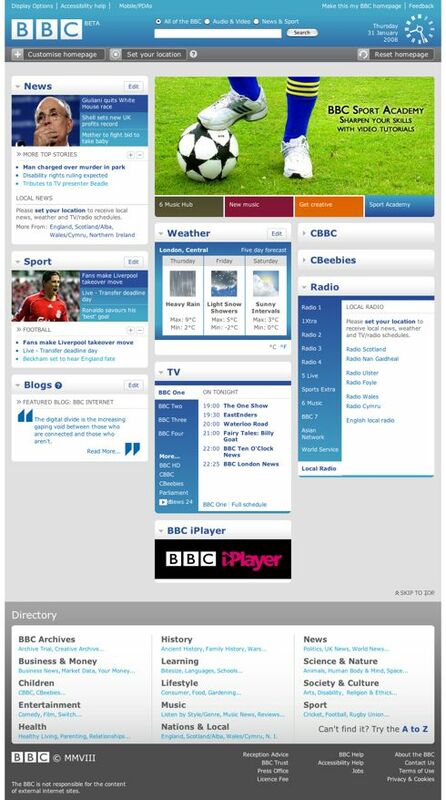 Richard Titus, Acting Head of User Experience at the BBC, has blogged about the project (A lick of paint for the BBC Homepage). Well worth a read and a healthy set of passionate comments from the viewing public. I have great faith in the BBC and the guile of their staff. If anyone can make personalisation really sing on a media site it is them. When the dot com bubble burst, many web design and development agencies went through very troubled times. During such economic downturns clients have less (or no) budget for major projects. All the indications are that 2008 could be a difficult year for many businesses and this will have an effect on web design and development agencies. But it isn’t all dreary news. During the aftermath of the dot com bubble, I spent 2.5 years working for Flow Interactive. In 2001 Flow was a small user centred design consultancy, but by 2003, while the general trend amongst web agencies was retrenchment, we grew. What’s more we didn’t just grow a little bit, we expanded by around 300%. I don’t think there was any particularly magic secret about what we did. We certainly didn’t grow through private investment, we grew organically to meet client demand. Why does demand for user centred design grow in difficult times? The simple answer is that UCD offers a range of services that offer great bang for their cost. Techniques such as usability testing and expert evaluations by a usability expert, when combined with web metrics, can help make and save very large chunks of money. For example, usability testing I’ve conducted for companies such as British Telecom (UK) and Yellow Pages (UK) helped identify and quickly increase completion rates by 100%. Now that isn’t to say that usability testing can be expected to increase completion rates by 100% every time, but if you’re an organisation looking to increase revenue without spending big bucks, now might be a good time to look at your web metrics and get some usability testing done. Maybe 2008 isn’t the year for that 6 month ethnographic study afterall, but I for one will be re-polishing my usability testing and expert evaluation skills. If you’d like to me to help you out with analysing your web metrics, or by conducting usability testing/an expert evalaution on your site, drop me a line at iain.barker at gmail.com. Why battle so hard to win new customers and then treat them so badly? The rule of thumb says that it is 6-10 times more expensive to win new customers than it is to retain existing customers (more at Wikipedia). So you’d think that any sensible company would make sure there existing customers don’t get disgruntled, annoyed, or even begin to consider that better options may lie elsewhere. My favourite company (!) Virgin Mobile has just released a Free to V service. As you’ll no doubt guess from the catchy name, the service gives you free calls to other Virgin Mobile customers. As someone who’s recently joined Virgin’s service (and someone who’s always up for a bargain), I thought I’d call and enquire as to how I can get in on this deal. Upon calling the lovely Virgin Mobile call centre, I was informed that this “great deal” is only available to new customers. Surely a strategy that encourages new customers (who are 6-10 times more expensive to attract) and at the same time annoys existing customers is the work of a very special mind. If Free to V is a loss leader to attract new customers, and if the loss is so prohibitively high that they don’t want to offer it to existing customers, this strikes me as a risky short-termist strategy. Maybe new customers will increase, but the retention rate for existing customers will surely go down. I can understand how a strategy like this got signed off, but I hope that a strategy based on frustrating your existing customers gets them what they deserve. I want to state that I have nothing against Virgin Mobile per se – and I actually kind of like the general Virgin brand and the way it has expanded and follows me around the world. But come on Virgin Mobile Australia – this isn’t a joined up customer experience strategy. The economic prospects for 2008 don’t look too promising for the world’s most developed economies. We’re in for a slowdown, or possibly something worse. When market conditions change, it stands to reason that a change in strategy can make sense. I’ve got 3 design related strategies that will prove useful if there are lean times ahead. forming an exception or a rare instance; unusual; extraordinary. We moved house recently. Moving house is always strewn with a mixture of good and bad experiences and emotions. We had an exceptionally good removal company (details below), we had some exceptionally good call centre change of address experiences, but oh boy did we get frustrated by most of the call centres we rang. All but two of the call centres we had to contact were experiencing “an exceptionally high volume of calls”. Now I’m not some customer experience extremist who expects companies to always have a representative ready at my beck and call (I’m an economy rather than executive kind of guy), but I get the feeling that these companies aren’t exactly being honest with me. Are these really rare, unusual occurences, or is this business as usual for call centres? If it is business as usual, isn’t their duty to be a bit more honest with us? In addition none of the companies had any mechanism to give me any indication of my position in the queue, or how long I should expect to wait (I appreciate this can be inexact science, but something is better than nothing). The biggest offenders have been Virgin Mobile (again!). My wife sat on hold for over 45 minutes only to be told that the department she needed to talk to wasn’t open for another 15 minutes (if only they’d had an unusually higher number of calls eh!). They wouldn’t even get the correct department to call her back when they were open (but the shocking customer experience offered by Virgin Mobile is worthy of an entire posting of its own). Have I been exceptionally unlucky in experiencing exceptionally high volumes of calls (am I just a zeitgeist-y kind of guy) or is this just the norm? Personally I don’t think it is acceptable to be so dishonest to your customers. I’ll be talking with my feet. For the record both Foxtel and the RTA had exceptionally short queues. If you are in Sydney and want a great removal company, Happy Removals don’t have a website, but you should call Tom Peng on (02) 9649 9605. I have absolutely no connection to them other than having been a very satisfied customer.